SOUTH BEND, IN. – The Moose Krause Chapter of the Football Hall of Fame will be honoring student-athletes at the 45th Annual Moose Krause Memorial Scholar-Athlete Dinner. The event will take place on Wednesday April 25, 2018, at St. Hedwig Memorial Center. This year, LaVille High School senior Jacob Good is among the nominees. Good plays football, basketball, and golf. On the 2017 LaVille sectional championship team, he caught 12 passes for 204 yards, three touchdowns, and a 2-point conversion. He also made 21 tackles and seven tackles for loss. On the 23-1 LaVille basketball team, Good averaged 9.5 points per game, led the team with 6.6 rebounds per game, and 1.5 blocks per game. Good also was the recipient of the Zane Triplet Dedication Award for basketball. Good has also performed well in the classroom, as well as on the field. 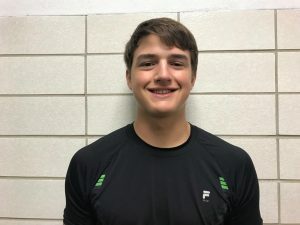 He has earned Hoosier North Athletic Conference Academic All-Conference in both football and basketball, received a gold medal in business and math for the highest overall grade, Indiana Football Coaches Association Academic All-State, and All-HNAC in football. Good ranks fourth in his class of 67 and plans to attend the University of Indianapolis. He has also participated in National Honor Society, where he served as vice-president. He is also a member of the art club, earth club, and peer tutoring. Good is also active in community events. He is a volunteer for the Lapaz Lion’s Club, Marshall County Junior Football League, Operation Quiet Comfort, and Lapaz baseball park clean up. The Moose Krause Chapter of the Football Hall of Fame has been serving the Michiana community for over four decades. The main focus of the chapter is to provide yearly scholarships that total $16,000 to scholar-athletes that lead exemplary lives within the Michiana community. In three and a half decades, over 800 athletes have been recognized and over $265,000 given in scholarships to help scholar-athletes achieve their aspiration. On Wednesday April 25, 2018, two $1,000 scholarships that are good for four years will be awarded. Also, four $500 scholarships that are good for four years will be handed out. There are a total of 44 young men from 27 schools that will be recognized prior to the announcment of the six recipients.